Well, it is a lesson learnt, that we should NOT do excess recharges to be in Queue. I have done Rs149x13 for one Jio number (later in first week of April done Rs999 to get SuSu offer as well). Forget the current better offer, I am NOT even getting the BOGO offer (which gives 1GB booster extra for those 13 recharges). The long term recharge is NOT as fruitful as I thought. 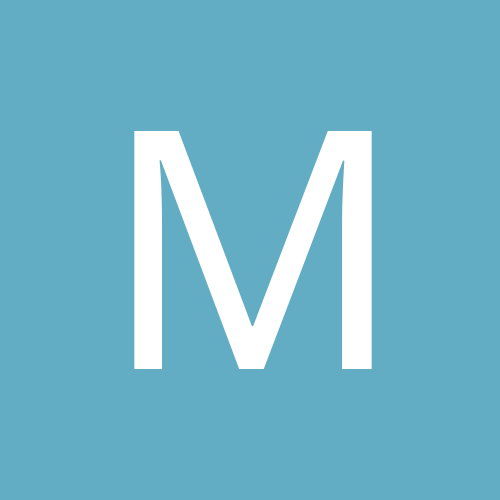 So do recharges only when the need arises to NOT miss a better offer in the pipeline. In other 2 numbers, I have done Rs999x2 in each no. There also I didn't get 10GB voucher as BoGo offer. That BOGO offer is looking like a bogus offer for me. Regarding BOGO offer on 149, in my statements under upcoming plans it is only showing 2GB, nowhere information of BOGO offer. 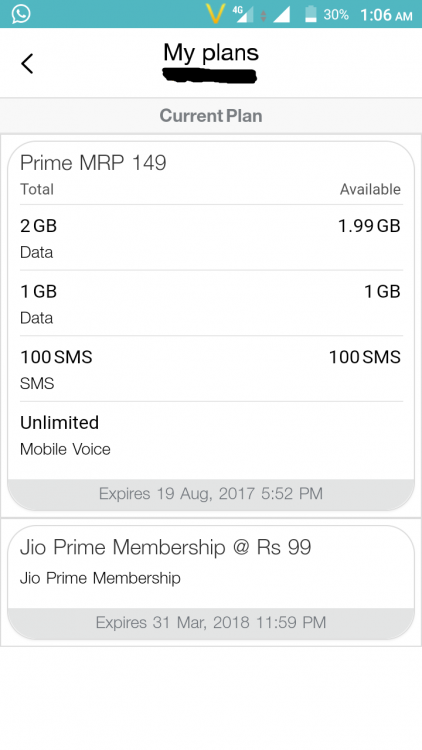 Have you raised service request with Jio for not showing that 1GB extra booster ? Please let us know, as I might have to do the same when my Rs. 149 plan starts in my another number. you mean 303 plan will have 56 days validity ? In my statements under upcoming plans, validity for 303 is shown as 28 days only. I don't think so.. Forget the Rs303 recharge, which is still having 28 days validity only. But what about Rs999 one? 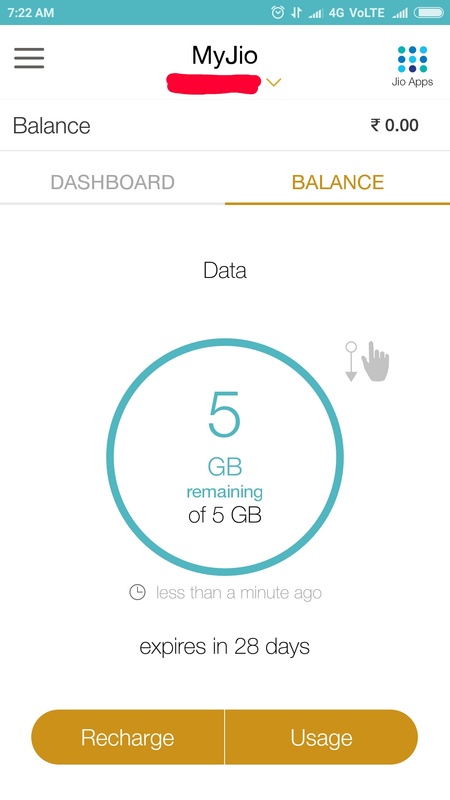 It now has 90GB data with 90 days validity. But my Rs999 recharges (twice done on each number) done before March31, are still showing 60 days validity (with 60GB data) ONLY. Thank you.... have just gone through the FAQ & they have mentioned that... So that means 303*3 was earlier giving total data of 84 GB with total validity of 84 days & now same will give data of 168 GB with validity of 168 days... correct ? Hope so things happens seamlessly without any service requests. This shows that unlike others Jio is not Rigid but considerate and values its loyal customers. Otherwise people like me who have done multiple recharges of ₹303/- would have been stuck with 28 days validity. The first 303 recharge will give 28 days (28GB) - as it has also provided 90 days Summer Surprise. Whereas 2nd recharge onward ₹303/- or ₹309/- will give 56 days (56GB) validity per recharge now. In short 303*3 will be 28 + 56 + 56 = 140 days (140GB) + 15GB (5GB*3) additional if applicable.There is also additional 5GB data benefit associated with every ₹303/- recharge done before 31st March 2017. So its all win win situation. For the first Recharge you will get 60 days (60GB) + additional data if applicable as it has also provided Summer Surprise (90 days) - there after 2nd recharge onwards ₹999/- will provide 90 days (90GB) (current offer) + additional data if recharged before 31st March 2017. Today my ₹303/- first Recharge has become active and also got 5GB additional data which appears in My Plan as well as can be checked by swiping up on the balance tab. See below. My next ₹303/- Recharge which will come into effect on 16th August shall have 56 days validity (56GB) + 5GB additional as promised by Jio & so on. Imho the only sufferers are those who did multiple ₹149/- recharges (like I did ₹149/- x 3 for my wife). I think this plan is purely for voice user & not intended for data user. 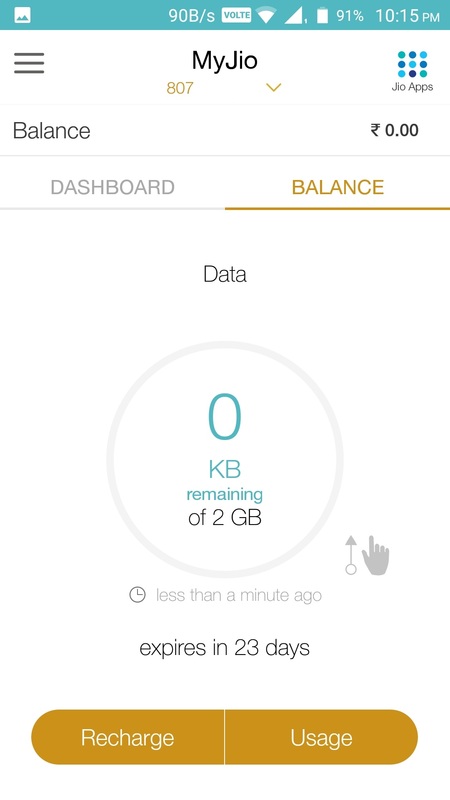 Although 2GB seems sufficient for Whatsup users. May be.. But it is NOT showing so in My Statement as well... My first recharge of Rs999 has already started with 60GB for 60 days (NO BOGO benefit). My second recharge of Rs999 also shows just 60GB for 60 days in My Statements. First everything was clear in MyPlans. Later it was messed up and shown in "My Statement" only. 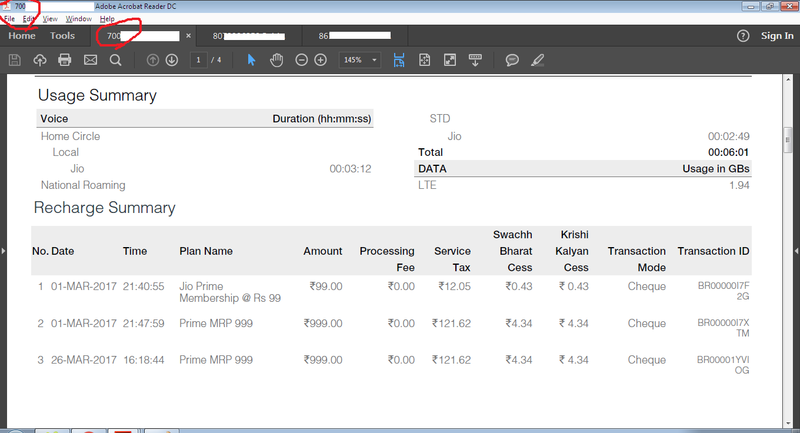 Now, even "My Statement" is incomplete (with 60 days for second Rs999 recharge and NO BOGO offer details). That's why I am repeating, "Jio's SW system is TOTALLY MESSED UP". Good that, you have got 5GB additional data as part of BoGo offer. 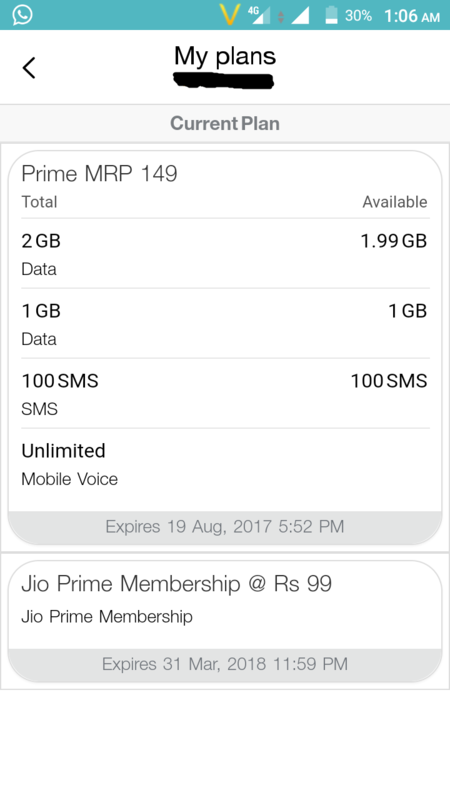 But I didn't get any in all three Jio numbers (2 with Rs999 and one with Rs149). Rs149 recharge was promised to have 1GB extra as BOGO offer and 10GB in case of Rs999 recharges. But all of a sudden, I got 10GB voucher for that 149 recharged number as I started to use it on my Samsung C9 PRO. So this Jio number recharged with Rs149 got 10GB Samsung offer this month and NO 1GB BuyOneGetOne offer as promised. 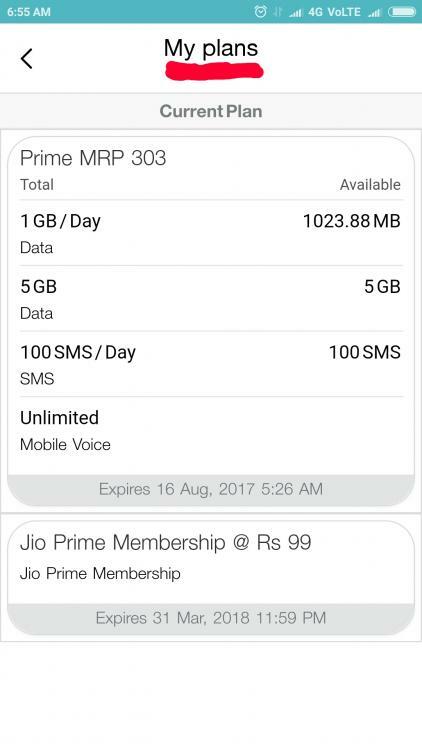 Both Jio numbers with Rs999 recharges, doesn't have 10GB extra BOGO data as promised. Both numbers have another Rs999 recharge in queue. 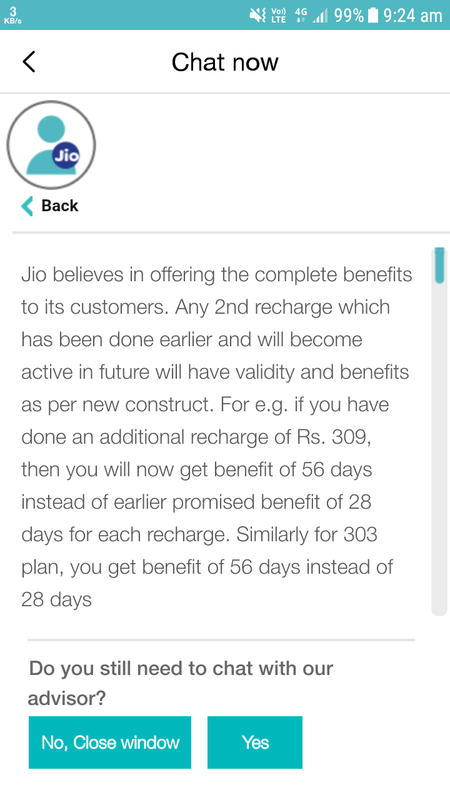 But that second recharge's validity is shown as 60 days only and NOT 90 days in "My Statement". The number in which 149 Recharge was done and 10GB booster is active (as per MyJio app), Data stopped working after the 2GB was exhausted. 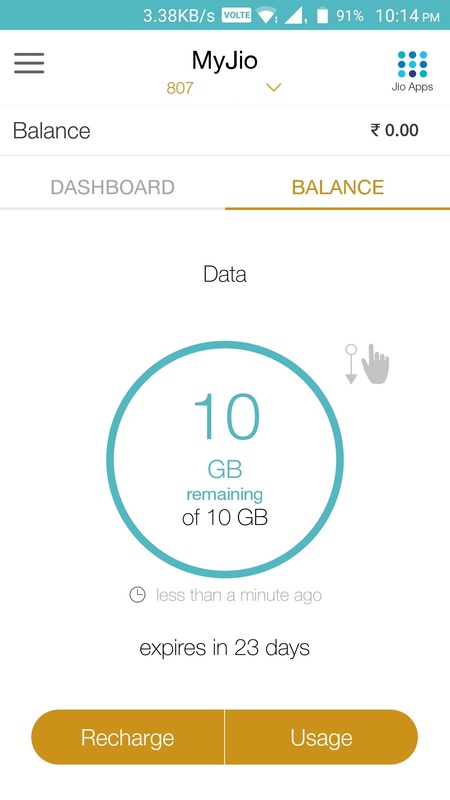 NO, that 10GB is NOT yet activated and even though that is showing in Data balance.. So I am wrong in saying Jio's SW as flawed, IT'S TOTALLY DUCKED UP ACTUALLY (U know what I actually meant)..
JDDD 399 "Adv. Recharge" done on 15-July-2017 [Rs. 50/- Cashback via JioMoney, Queued]; DDD 309 validity Expired today [20-July-2017; 06.37AM]. 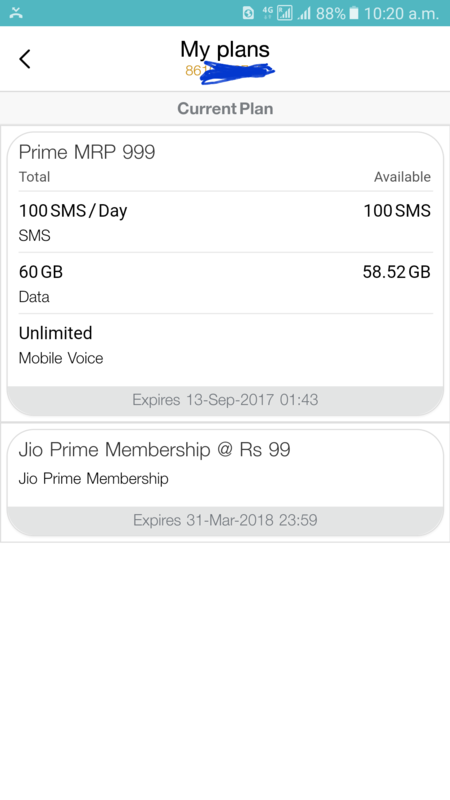 Happy with Jio, no multiple Recharges! do we still get Rs. 50 cashback for recharging plans through Jio Money ? No. It has been discontinued. But you can encash already earned ₹50/- Cashback voucher till 30th September 2017. NO, that 10GB is NOT yet activated and even though that is showing in Data balance.. 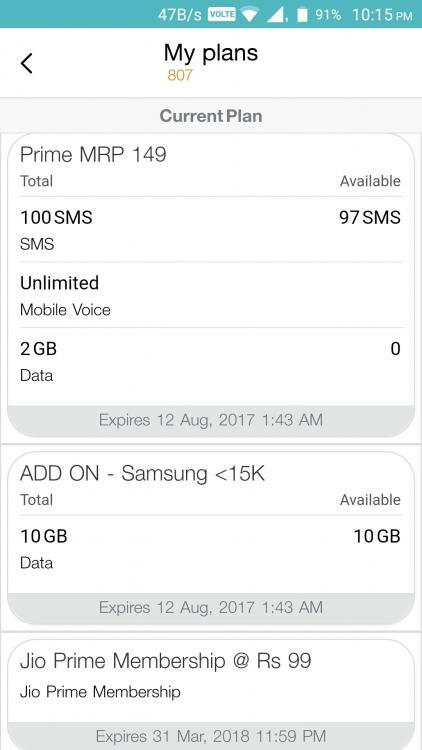 Although it is showing that you can avail 10GB (Samsung offer) but it will only get activated with recharge of ₹309/- or higher & not ₹149/-. It will appear under my vouchers as add on after recharge of ₹309/- or higher and thereafter will have to manually enable/activate it by selecting recharge option in my vouchers to use it. 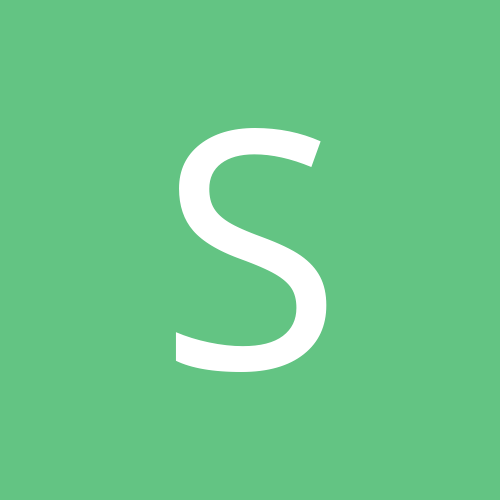 Check "Samsung offer" details under Faqs for clarification. OH, come on bro... 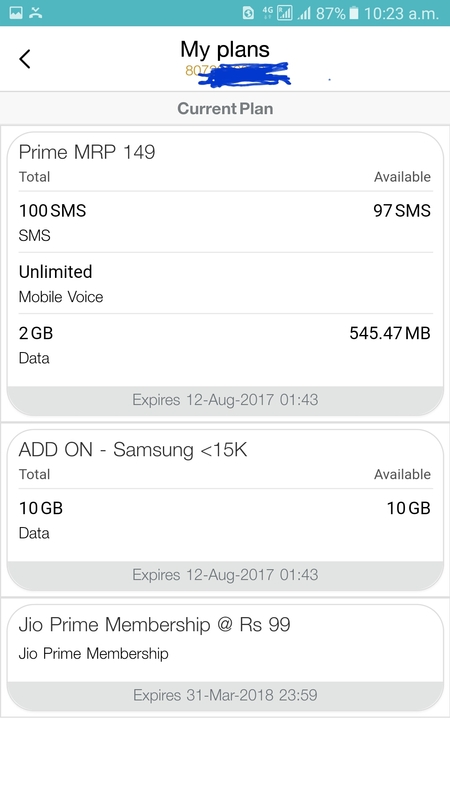 I know all these and I have done Rs99 prime + Rs149x13 (during March2017) + Rs999 (during April first week to get SuSu 100GB offer) + Rs399 DDD (84 days 1GB per day) on that particular number already (validity now upto 5th Jan 2019 <<If that 999Rs validity is 3 months>> I think). I got the 10GB voucher on MyVouchers. Then I claimed it and it is showing in my jio app, after the scroll as well. But I just can NOT use it (I have exhausted the 2GB already). Anyway I didn't get 1GB extra data of BOGO offer as well. One of my friend had SuSu offer yesterday night. He had done recharge of Rs. 149 earlier, in the morning his 149 plan got activated & he got the BOGO offer also. He is getting 3GB in total for 28 days. OK. Let me show you where the 10GB offer was applied as below.. 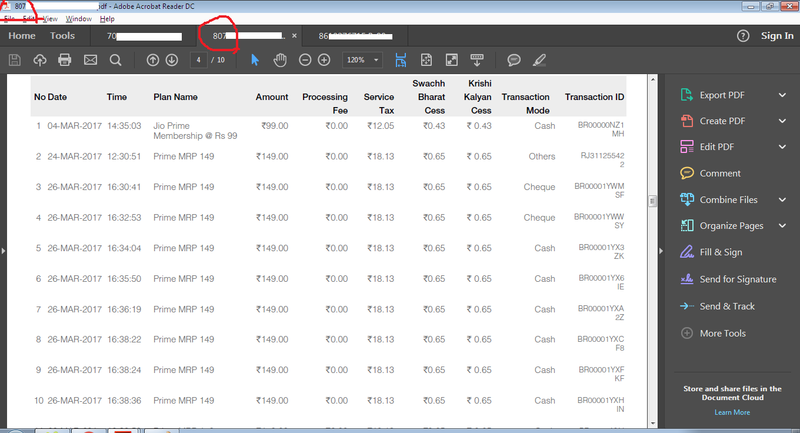 The date on which I have recharged prime and other Rs149 recharges are shown in my previous posts... 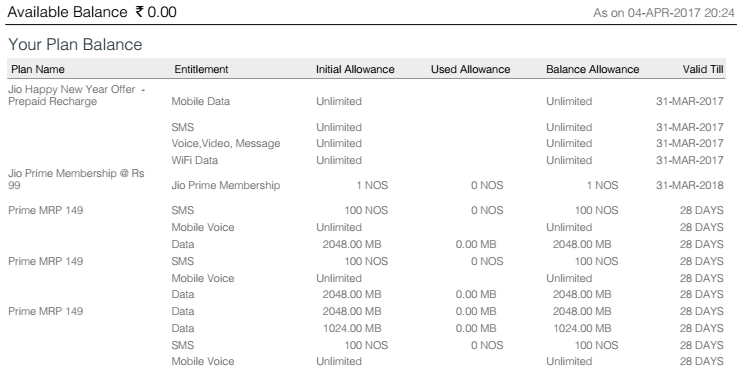 So I have 10GB data booster applied in my plan, which I CAN NOT use. 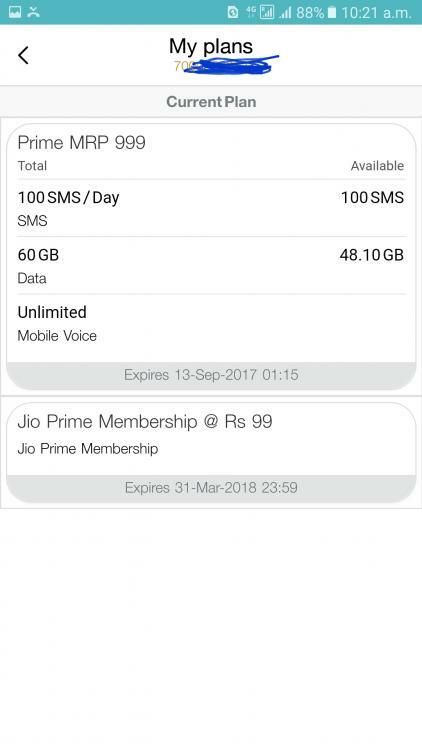 No BOGO offer for the recharge(s) done on March 2017 for some jio numbers (mine is an example)..
Once again, I am NOT saying Jio is cheating -- because they have been giving 100s of GB even for freeloaders, hence giving 1GB extra for paid customer will be no issue for them. But what I am trying to say is their SW system is totally ducked up.. The thing which happened to me today, can happen to anyone in coming days and it is TOTALLY out of their control, which is the sad thing. But what I am trying to say is their SW system is totally ducked up.. Yes ! you are absolutely right. 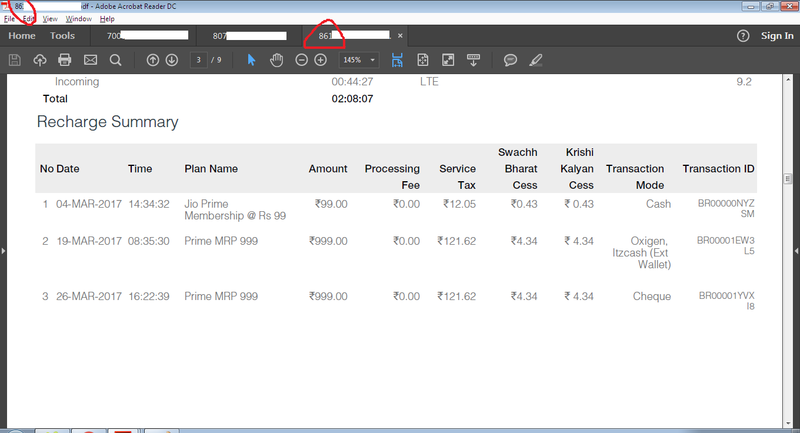 I also didn't got 1GB Extra against my wife's ₹149/- recharge (had done ₹99 + ₹149*3 during March & ₹303 in April for Summer Surprise). After the Summer Surprise got over on 19th July the ₹149 recharge got activated for 28 days (till 16th August) instead of ₹303 as expected and ₹149*2 & ₹303 is showing queued under My Statement. So the recharges are getting activated chronologically as was the order of recharges. I remember that 1GB extra for ₹149 was announced later after 25th March so who ever recharged after that may get it directly whereas other users who ever recharged before that may have to approach customer care to get it added manually (Software glitch as pointed out by you). See my wife's recharge history below and the Plan balance info also - 1GB extra is shown against my third ₹149 recharge which is done after 25th March & not against my earlier recharges. Further Jio did announce to pass on the extra benefit (current validity) for ₹303/₹309 or higher candidates but neglected ₹149 users (could have increased either bonus data or validity). Seems they want to discourage ₹149/- customers. Update (21st July) : Called customer service today morning and was assured that my case is escalated & 1GB extra will be added to my account in 48 hours. Let's see. 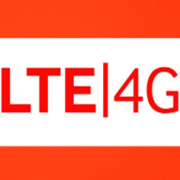 Exactly @LTE4G you are right.. Yes, extra 1GB is seen on other 12 recharges of Rs149, in that number. May be they are trying to say that BOGO offer is for one week only 25th March to 31st March only. 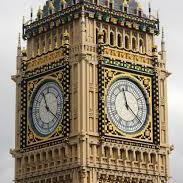 The one who have enthusiastically recharged earlier are all ULLUs.. So once again, this proves that "NEVER EVER DO ADVANCED RECHARGES FOR JIO". Now I wonder what is stopping my 10GB booster data. 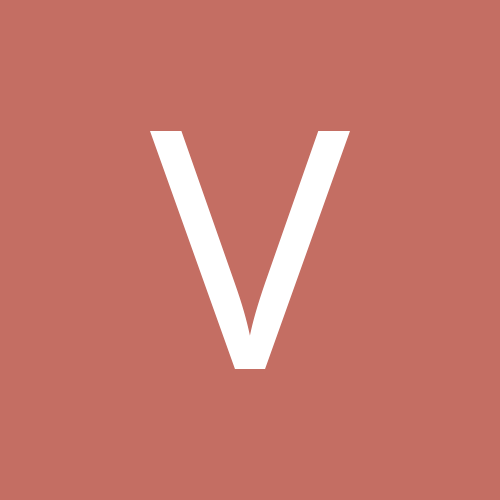 I had a Rs.50/- "Discount-voucher" (Cashback) from earlier DDD 309 Recharge via JioMoney & the validity was 30-Sept-2017. Applied the same for JDDD 399/- Recharge via JioMoney and my effective Recharge became Rs.349/- [399-50]. I didn't get any Cashback-voucher for JDDD 399/- Recharge, I presume Jio no longer offers Cashback! Yes you are right. Since Jio keeps pouring new lucrative offers doing multiple recharges prevents us in availing new offers immediately. Yes Jio is not only listening but acting promptly too (as in my case). So those who have not received BOGO data should immediately call Jio and get it.